David’s honey-do list has just gotten tougher! When Susan told you, she was sick and tired of cleaning grout in your master bathroom shower and YOU had to finally do something about it you weren’t exactly jumping for joy. Oh boy – another major remodeling project thrown onto your already too long honey-do list. As she made her remodeling demand known (loud and clear) you couldn’t help thinking you’d much rather be eating honeydew than doing the honey-do list! You’ve been putting Susan off for years on this shower job. It doesn’t take a rocket-scientist to see your tile shower is a scummy, moldy mess. The shampoo bottles sitting on the floor aren’t exactly the safest thing either. Headache #1 – The walls are ½” out of square (that’s par for the course for this house). 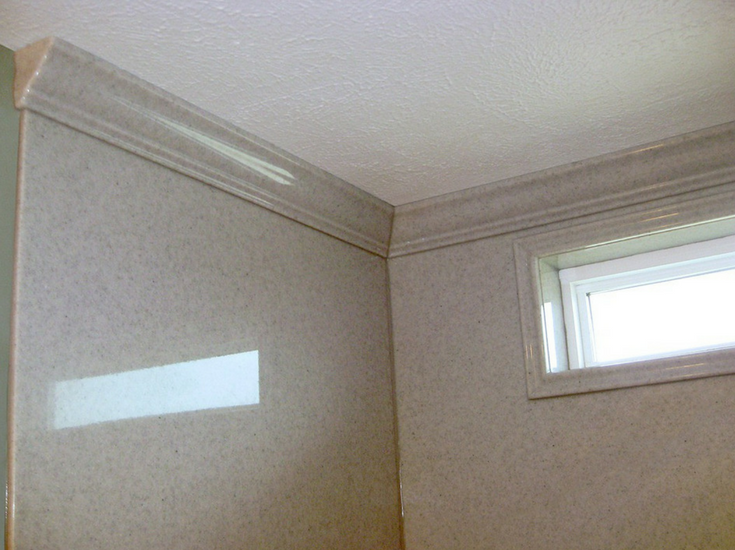 Headache #2 – There is a window smack dab in the middle of the back wall in your first-floor bathroom. You know Susan hates the privacy blinds in the shower. Headache #3 – You’ve got 4 uncommon wall sizes in the shower and there is also no place built into your existing shower to store soap and shampoo. You’re no rookie making this home center store trek. You’ve done remodeling in the three homes you and Susan have owned over the last 25 years. Now, even though both of your “little girls” are off at college (wow – how time has flown) and your a ‘quasi-empty-nester’ – the need to bring out your inner “Tim the Tool Man Taylor” has not gone away . The wall panel sizes are rectangular and consistent in size (that’s what you’d expect from mass produced wall panels – but they won’t solve your out of square problem). You don’t see any trim offered to work around the window. (you also have to figure out the window privacy problem. Susan is tired of the blinds in the shower). 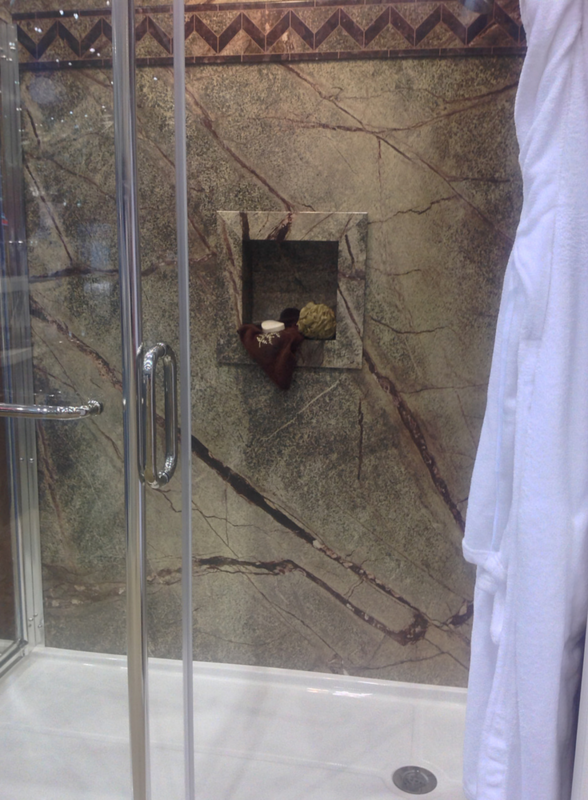 All the shower wall panel kits are in standard sizes (60 x 32, 48 x 36, 36 x 36 etc.) which won’t work with your 4-wall custom sized shower. The young dude in the orange smock you get to “help” you is clueless on how to make their products work with your custom sized shower. Houston – you have a problem! A shower wall panel installation project can be a headache (especially with custom sized showers) if you don’t have a few “tricks” (AKA – products and installation techniques) up your sleeve. 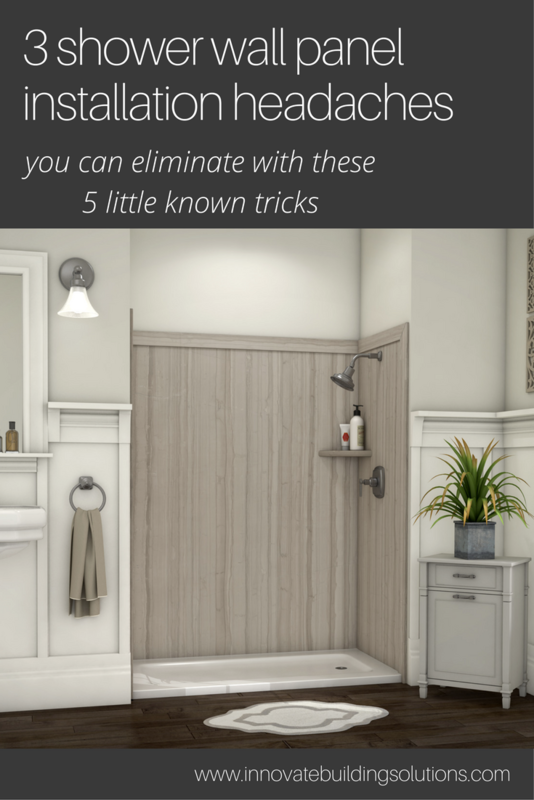 Below we’ll take a quick look at 5 little-known ideas to get rid of your shower wall panel installation headaches. You’ll get Susan the shower she wants (and you know she deserves – despite the fact you don’t really want to do it!). At the end of the article let me know if these tricks were helpful to you – and if you have any cool tricks up your sleeves to share as well. As you know from past home improvement projects when walls aren’t out of square – you are amazed. Maybe the carpenter who framed your home was having a bad day. Maybe your home settled. Maybe all the framing crews are slapping stuff up too quick. In any event, you’ve deal with the fact your side to side measurements aren’t the same. A simple solution to this problem is to use corner trim moldings. They are available in the same materials as the wall panels and are sized 1” x 1” or 1 ½” x 1 ½”. 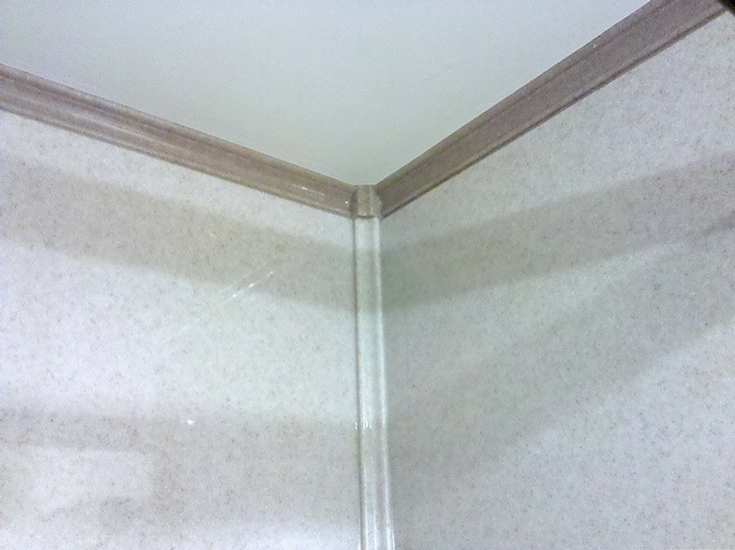 These trims can “fudge” your corners so you don’t see big caulk joints. They can add a higher level of water protection– and cut the maintenance of the caulk joint in the corner. You can also use shower wall panels which have simple to cut sections (like these laminate shower panels shown below), so you can make your final cut on an angle to adjust for your out of square opening. 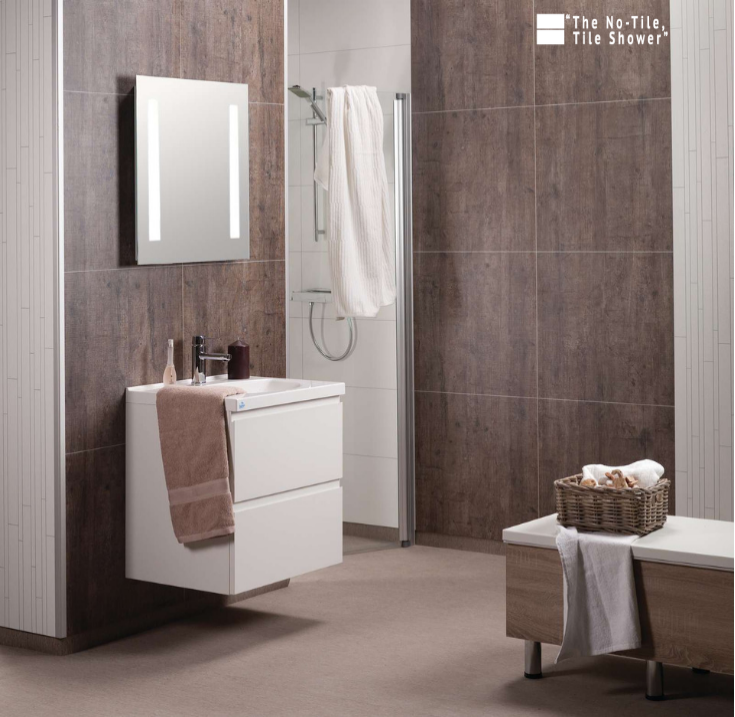 Laminated wall panels which look like wood ceramic tiles – but they have no joints. 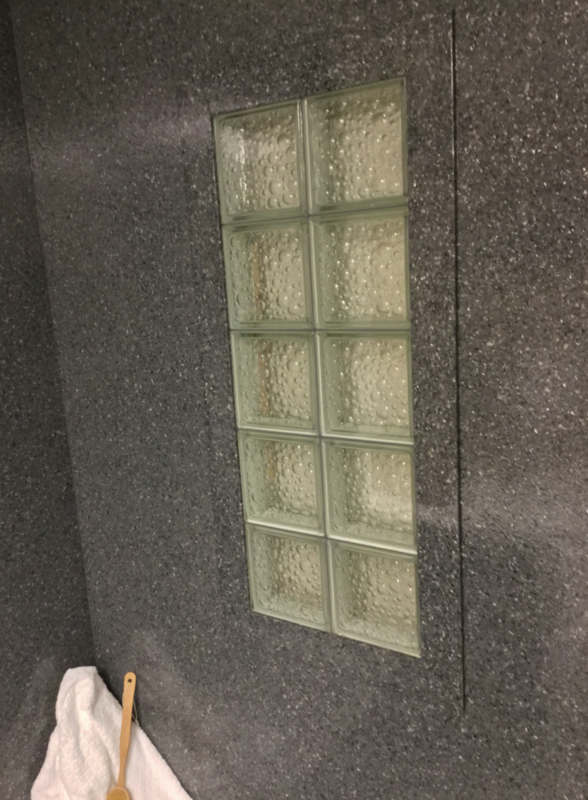 (1) A glass block window – Glass block shower windows are sturdy and come in moderate and high privacy patterns. If you want air flow a small hopper style air vent can be added. Since there is often no frame around the blocks, you won’t have to worry about rotten wood around the edges. 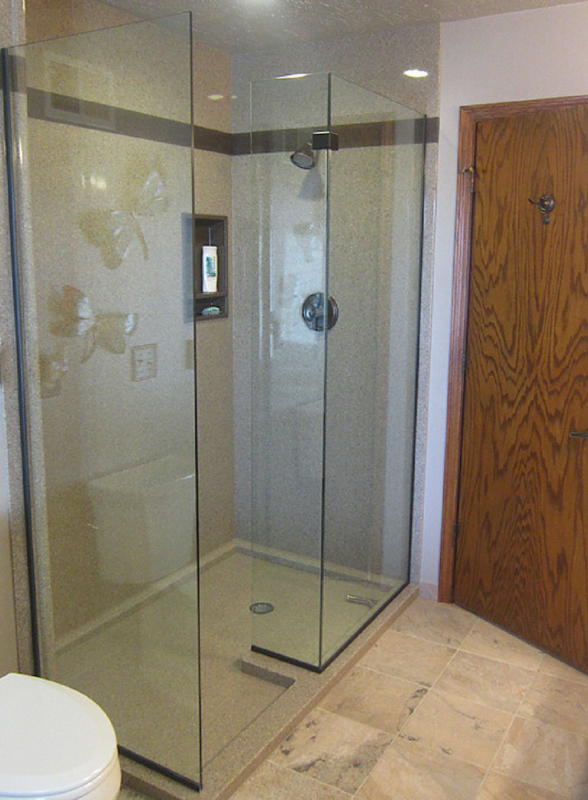 (2) An obscure glass vinyl replacement window – A vinyl framed replacement window holds up well in a steamy shower. If you go for a casement (crank out window) you’ll get more air flow and improved ventilation. (3) An operable acrylic block window – Like the glass block window you can get a glacier pattern acrylic window which will give you complete privacy. This window can fully open (using a casement or awning style) unlike it’s glass block counterpart. Once you have the window choice made, you also need to consider where the window is set inside the opening. If you move the window further in towards the shower you will be able to use simple “flat stock” trim to frame it out – saving you time and money. Choosing the right trim to work around your window is critical for a job which lasts (anyone with wood trim around their shower window today has experienced the pain of the wrong trim). There are 2 ways to get your arms around this trim problem. Option 1 – Custom made window trim – If you’re handy but wouldn’t exactly call yourself a master trim carpenter (and your wife wouldn’t call you this either) custom made window trim is the ticket. With waterproof solid surface window trim kit, you can get different casings, a finished window sill and apron which give you a custom look made for your window size. Option 2 – Window trim pieces you cut to your size – This option will cost 2/3 of the custom trim. You will use 8’ long pieces of trim in the same material as your walls. You trim to size to fit around your window. 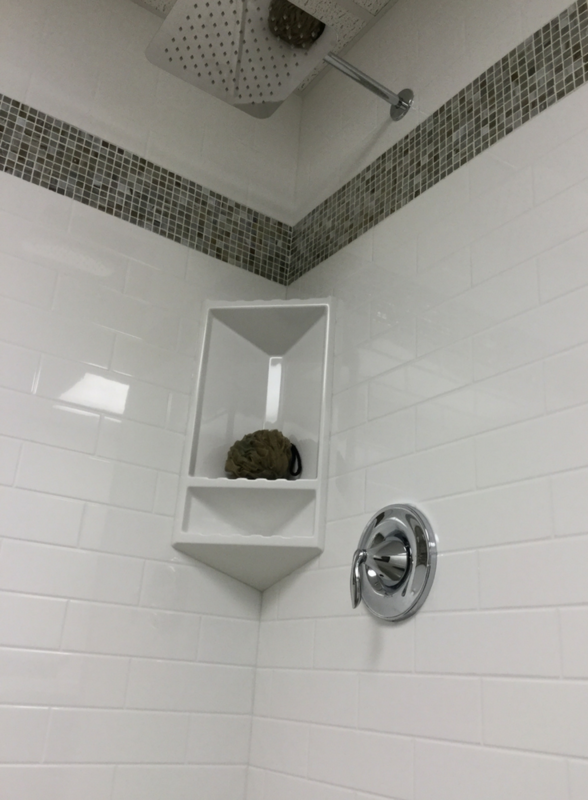 Standard sized shower kits aren’t going to work in custom showers (it doesn’t take a genius to figure that out). One way to complete a custom shower is get panels cut to size (so you eliminate the need to cut or piece them together yourself). Using products like solid surface shower panels each wall can be made to your size specifications up to 100” x 100” inches (although a panel this big isn’t too practical to get into the door – ha! ha!). The drawback to this product is these panels are very heavy (a 60″ x 96″ x 3/8″ thick back wall panel can weigh 130 lbs.). If you want to keep weight down the laminate panels are 2′ x 8′ x 3/8″ and only weigh 26 lbs. per panels and can be cut to fit (see these lighter – yet sturdy – panels below). If you don’t want to use custom sized panels, another option is buying standard panels and joining them together with flat seam trim. If you do seam the panels together make each panel on the left and right sides of the trim the same size (I admit I’m a bit of a “symmetry guy” so the different sizes would be like a lopsided picture on a wall to me!). You need to get shampoo bottles and soap off your shower floor (and the ugly cheap plastic shower storage tree hanging over the shower head has got to go). While it is possible to create your own niche with shower wall panels it’s also time consuming and can lead to leakage problems. I recommend using a system with premade shower niches. This simplifies your installation since premade niches have edges around the perimeter which slip over the wall panels. You can find these niches in decorative PVC composite wall systems, solid surface panels and acrylics. For an even easier job use a corner caddy which is installed after the wall panels. DIY shower wall panel installations don’t have to be a pain – if you have a few tricks up your sleeves (and know a few of the right products). Are any of these 5 tricks new ideas to you? Do you have any other tricks you’d like to share, or questions to conquer your odd-sized shower? Please comment below or give us a call. Can I (or a member of my team) help you? 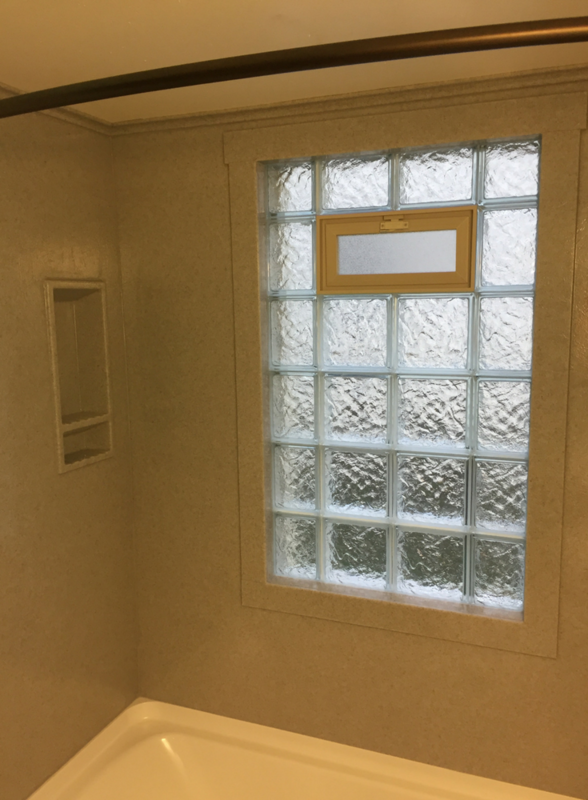 For assistance with a shower wall panels installation or factory-direct DIY shower wall panel supply contact Innovate Building Solutions at 877-668-5888. For a shower remodeling project in Northeast Ohio call Cleveland Design and Remodeling at 216-658-1270 or The Bath Doctor in Columbus at 614-252-3242. Can’t the panels be cut to fit the wall dimensions? Do you have a solution to replace the shower pan for a do-it-yourselfers?